My Crochet Temperature Scarf. Each row documents the high temperature in New York City for one day during 2013.Try it out with your own city’s weather! I first learned about conceptual knitting through the work of Lea Redmond, an artist and knitting designer who brought conceptual knitting into the mainstream with her Sky Scarf and Mood Scarf patterns. Conceptual projects can easily be created using crochet, too. Conceptual designs challenge crocheters to step outside their typical comfort zones to create unpredictable projects. When finished, these projects also serve as infographics that visually document a time period. A conceptual project can be a great way to get over “crocheter’s block,” experiment with colors, or create a unique memento of an important time in your life. 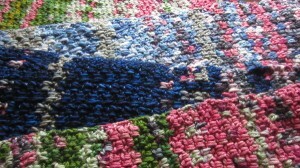 The basic idea of conceptual crochet is that you crochet one row or motif per day over a specific length of time. Color selection for each day’s stitching isn’t predetermined; rather, it is based on a color palette that is linked to a range of measurements representing the project’s overarching concept. Popular conceptual projects include those that document the weather (through temperature or sky colors) and those that record the crocheter’s mood during the project period. In addition to choosing the concept, you’ll also need to pick a project to serve as your canvas. A simple shape, such as a rectangle or square, is ideal, so projects like scarves, one piece blankets and modular projects work best. An existing conceptual crochet design may be the starting point for your project, or perhaps you have a favorite stitch or motif pattern you’d like to use. Consider the interplay between the length of your project, the size of your pattern stitch or motif, and the size of the final project. For a year-long project, a 365 row scarf worked in treble crochet might be too long to wear comfortably, but a 365 row blanket worked in single crochet might be too short to cover your mattress. For my first conceptual crochet project, I picked machine washable yarns that I purchased at special events such as yarn crawls and fiber festivals. I wanted to use yarn from my stash that had special significance to me. I used a broader range of colors than I usually would for a project, but I picked colors that were harmonious together. 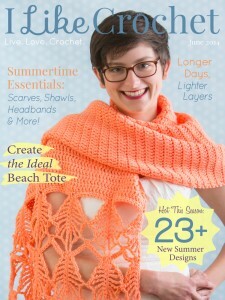 Other crocheters buy yarn specifically for their conceptual crochet projects. When selecting yarn, aim for consistency in care instructions for ease of washing. Remember that since you aren’t planning striping and color placement in advance, each yarn should look harmonious when paired with another yarn in your project. Keep in mind the quilter’s adage and use at least seven colors. You may find that using yarns from the same manufacturer eases the process of finding colors that work well together. Once your yarns are selected, create a key that matches each yarn to a range. Each yarn may be a literal representation of your concept, such as a color that is similar to the midday sky in your area. Each yarn can also figuratively represent something, such as a mood. You will use the key to determine which yarn to use for any given day’s crochet. Once you have your yarn, stitch or pattern, and project selected, and your key is set up, you’re ready to start! Some crocheters find that working one row or motif each day is an easy commitment to keep. If you prefer to crochet multiple rows or motifs at once, record your information in a notebook or on your Ravelry project page so you can refer to it when you have time to crochet. When I was crocheting my temperature scarf, I crocheted once a month for most of the year. I was able to view the historic daily high temperatures for my city online. On the other hand, for a mood project, it would be difficult to recall your mood on a particular day weeks later. Because conceptual projects are unpredictable and longterm, it can be difficult to stay motivated. Some crocheters find that joining conceptual crochet-a-longs helps them to stay motivated and accountable. 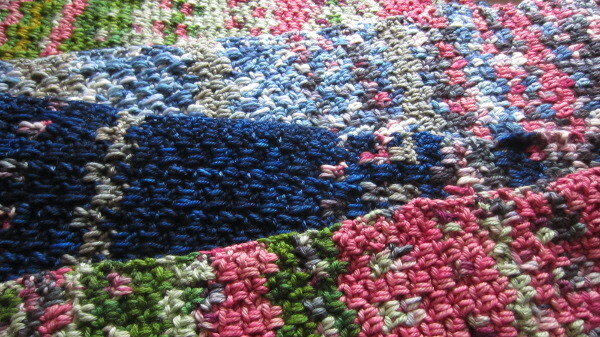 Others find that setting aside a few minutes a day for crochet makes the project more manageable. Whenever you’re losing motivation, remember that a finished conceptual crochet project is always a great conversation starter!